Go to hotjar.com to copy the Tracking Code from the Hotjar admin. Login to Instapages and open your landing page. Click on Settings from your edit screen. 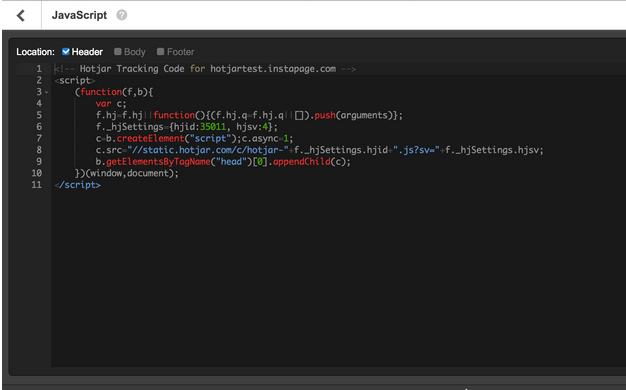 Paste the Hotjar Tracking Code into the Header. Your Hotjar Tracking Code is now installed. If after you install the Tracking Code, your website undergoes a major design change check to ensure your Tracking Code is still installed. You can start using any of Hotjar's 8 features: Heatmaps, Recordings, Forms, Funnels, Polls, Surveys, Recruiters and Incoming Feedback. Have a look at the guides below to get started. Add users to your Organization. Add Sites to your Organization. Understand the difference between Accounts, Organizations, and Sites. Use Hotjar for your clients.